I held on to this piece for years. I’m not sure why I did, but the sketch of this laid barren without paint, and over time through all the cities and storage spaces and apartments, this piece gathered a smearing cloud of graphite that blurred throughout it’s entirety. In my head, when I envisioned a book about this, (before there was even an idea that I’d have a retrospective book at my age) this was to be the cover. Finally at the near end of the project I fished through the myriad of unfinished works to find this painting. Even though this wasn’t the cover, this held strongly in my heart about what this book would be about. .. and not just any art, but fine art. Thats the thing about the art world. There is such a great divide between the commercial art world and fine art world. I believe it comes down to the presence of content and context, and often as commercial artists we are seen as lacking both (and we aren’t). I remember when I had moved back from Los Angeles to San Francisco a few years ago. I was with a new group of artist friends that I had recently met. They had invited me out to this DIY gallery filled with yarn sculptures and abstract paintings… all which I heavily enjoyed. When I was introduced to some of the artists in the gallery, a guy from the new group had said “This is Tennessee and he’s an artist too…. well… not really.. He’s not really an artist, he works for Disney”. It took me a few minutes to feel offended because I was just confused why someone would introduce me as such. It was almost like finding a bruise that hurt, but the incident of getting the bruise was a mystery. I left the gallery shortly, and never returned the calls from the guy who said those words… .after all.. why be comrades with a fellow artist who doesn’t think you are an artist? See.. thats the thing about TENxTENxTEN. It isn’t just about Mickey Mouse… its about so much more than that. It’s about bridging the gap between commercial art and fine art and showing the world that these two things can coexist together. It’s about showing that a character such as the lovable and memory inspiring Mickey Mouse can transcend its commercial state into something so much more. This book was about not just that, but that Mickey can swim in multiple universes beyond the park and the product… and in fact TENxTENxTEN’s sole purpose was to focus the icon as an anchor that swims in the universe of cultures, cities, art movements, memories, emotions, senses, and everything in between. When I look at this piece, I see the bold statement ART, and that in itself is far more complex that the sketchwave patterns that blurt out of my hands. This piece is entitled “Twice Upon a Time” which reflects the nature of commercial art and fine art, as well as a mention to the beginning statements of fairytales that Disney is known for. It was strange how this project of 10x10x10 unfolded as the years went by. I mean, how can you make 100 portraits of the same silhouette and not change? I look back at my first portrait in where I was relying on the safety of geometric borders and semi-clean lines, … and realizing after the 8th one… that I’d have to blur into something beyond what was comfortable for me. The whole project really began when “Wake Up and Smell the Sound of Coffee” happened (and that was an accident)… and then my whole world exploded. Suddenly I was all over the place. I drew hundreds of different drawings because suddenly I had permission to. Portraits like “Everything is Going to be Okay”, “Cloudbusting in the Air”, and “Lightbulb City: Population Infinite” were crammed with just random objects that were more of me relearning this realm in my head as an adult (as it existed for me as a child). These icons were the characters that solidified my future work, something that made me feel that finally… I had reached the greatness of my work. When it came down to it however, my comparisons of “Warhol with Geometry” began to fade… suddenly when the characters solidified I began to get comments like “This reminds me of Haring a bit”..
And I totally realized they were right. I’ve always strived for originality in my work, but I have subliminally always been influenced by the things that struck me most as a child. … and Steve Rizzi and Keith Haring were my top favorites mainly because they were so off brand in a time that was so staunch with the remnants of clean vibrant pop. More so, in the 80’s as a closeted queer kid in the south and learning about a gay man from Pennsylvania making it work for himself out in NYC… and not only making it, but using his fame to call for queer power and fighting the AIDS crisis with a brush and pen… well.. that was the epitome of art to me. While “Haringesque” was not a part of the “Contemporary Modern” series initially… I have my reasons. I wanted to make sure my skills were perfect before I painted the hero that made all queer artist’s work like mine evident…. and well I had already reached 10 in the series before I could feel that way. Regardless, I love him and his work, and I am honored to be an artist that people see a resemblance in aesthetically. I’ve often, throughout my years growing up, viewed myself as a city, in where all the components of my history, and all the people I’ve met along the way, would become structures of my life. After all, who are we without the people who supported us, encouraged us, and gave us permission to create and do the things we do? “Loveless City” is a piece about that concept, in where everyone who has supported me transformed to be a building, park, lake, or thoroughfare in my life. I imagine myself as a child, being a one street town with my parents and siblings as the center of this small place… and as I grew older and met various teachers, friends, and lovers along the way, I’d build myself from a small village to a sprawling metropolis with endless possibilities for expansion. Districts like “Underwater Town”, house the buildings of people who supported me through my darkest days. “Lightbulb City” is the district that houses the people who supported my art and encouraged me to keep on going. “Pyramidville” is a place that entails the people that I am inspired by, and the two beaches are the restaurants who helped me financially get by as an artist. Lastly, in the face, is “Upsidedown Town”, which resides the support of my crazy ideas and philosophies that I’ve carried within the depths of my psyche growing up. All these people, built me from who I was as a confused child, to the crazy artist I am today, … and without these people I would be no one.. I would be that small town in the middle of nowhere with little to no support to grow beyond myself. It is in this piece, that I want to let everyone who has been a part of my life know, that I love you and appreciate you for making me who I am today. Daniella Aiello, Amy Trauger, Cris Gibbons, Kim Rein, Diana Flores, Paul Festa, Mike Uljanic, Todd Doane, Shelley Mayen, Tracy Stroud, Eric Lange, Mike and Dana Kungl, Keri Rincon, Michael Young, Noka, Nolan, Avery, and Geneva Aldoroty, Trevor Carlton, Merilee Hanna, Matt Locke, Mario Valle, Richard Carter, Tim Rogerson, Hadeis Safi, The Harkoviches, Erica McCarthy, David Pacheco, Eric Huntoon, Edie Modular, Heklina, Peaches Christ, Xavier Gerbaux, Mart Basa, Michael Lazar, Greg Cassius, Cody Bayne, Ara Thorose, Andrew Baker, Nick Leoni, Mark Gorog, The Chows, Nina Grey, Monica Schrock, Chelsea Patterson, Johnny Raymond, Sidoe Dukemajian, Atom Basham, Olivia Semple, Niki Khanna, The Winklers, Didi Dunphy, Tor Keeslar, Chave Alexander, Julianna Cuevas, Gillian Grawey, Franz Szony, Bonnie and Lily Varner, Jackie Beat, Caryll Cruz, Melissa Daywalt, Mario Graciotti, Jason Salas, Troy Carlson, Joshua Magallanes, A.K. Miller, Eli Francis, Sara Pooley, Asleep Hernandez, Aaron Mattocks, Rebecca Peloquin, Frances Sinkowitsch, Txeo and Romain, Galla, Mike Will, Meredith Barry, Leslie Combemale, Dave Bossert, Dawn Pierotti, David Jozef, John Keenoy, Christina Henri, Sandi Turner, Chantal Pfäfflin, Greg Barnard, Katie Kane, Lindsay Block, Liam Carl, Ryan Bellis, Cassie Drennon, Mishel Castro, Krystal Richardson, Lori Divine, Marty Robbins, Mia Saiz, The Toro Family, Maggie Duckworth, TJ Thompson, Ben Berman, Deven Green, and Lenora Claire.. Thank you from the bottom of my heart. You may not have realized in the short (or long) time that we have known each other… but you have influenced me to be my greatest, and to that I am forever grateful for knowing you. Just fresh from my stay in San Francisco, and a long stay out in Berlin, I ended up out leaving Los Angeles out to Las Vegas, NV. At the time, Neil Cantor of The Hanna Barbera Store , and later “The Chuck Jones Experience” collaborated with me on a “Loveless Collective” store out in downtown Las Vegas off of 7th and Fremont Street. I moved my work into “The Container Park”, which was a collective of shipping containers that functioned as stores. While I was friendly with all the store owners of the Container Park, I was particularly fond of Mya and Elisha, whose store resided next to my gallery. I spent many summer nights with them outside in the lounging chairs beyond our 2nd floor spaces, and talk with them about life, art, and living in Las Vegas. Mya and Elisha specialized in stained glass creations, which were by far the most brilliant I’d ever seen. Elisha often would come in my store with an interesting commission and we’d talk about all the work she’d do. Literally everything that came her way was no challenge to her, and often I’d watch in awe as she would create numerous logos, faces, phrases, and even the “flying spaghetti monster”. It was at this point, I asked for her help, as I wanted some kind of history of our friendship a part of this series. After all, 10x10x10 had become more than just pieces of work at this point, and more so a collection of stories and experiences of all the places and people I had met. We decided to work together in creating a piece for the collection, and this was the result. “Through the Mickey Glass” transcends a lot of pieces in the fact that it talks about the silhouette beyond the painting formation, as well as the historical formulation of my time in Las Vegas and my friendship with the talented glass artists Mya and Elisha of “Lead in the Window”. I suppose you could call this a sort of “John Malkovich” approach to the subject, since thats clearly the only surface reference that comes to mind, but it seemed to work when looking at the idea. I would imagine, that if given the chance to do so.. Mickey would be thrown into a twirling kaleidoscope world, filled with a maelstrom of emotions clamoring about. While there would be structure, the complexity and multitude of being would be overwhelming.. creating this world of chaotic happiness.. 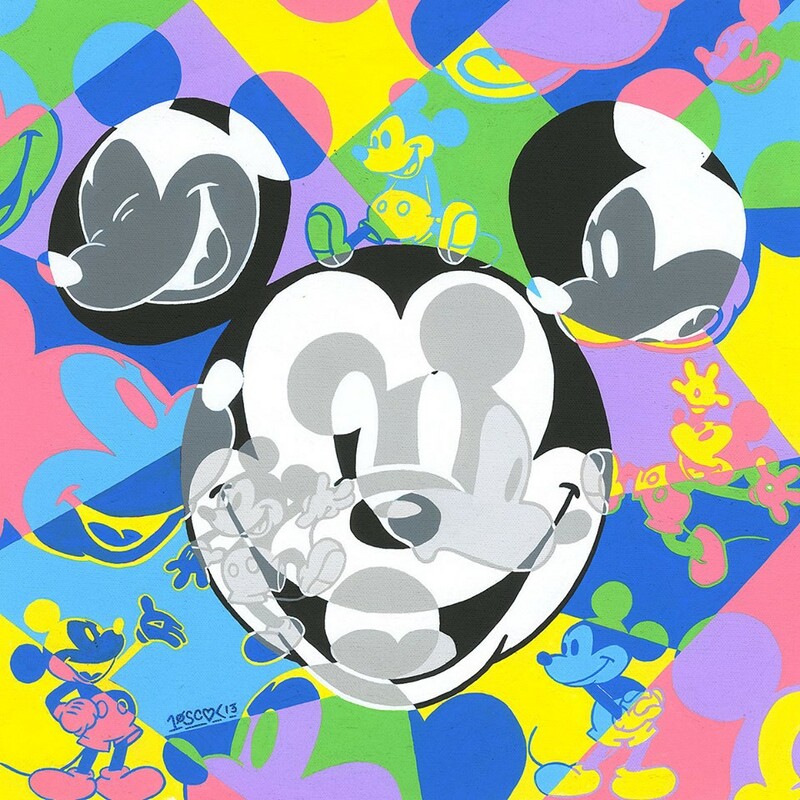 This piece is called “Multi Mickey” (originally I wanted this to be called “Multiple Personalities”), in where Mickey’s in different sizes and expressions float through the central figurehead of the TENxTENxTEN Mickey silhouette. This is the 4th piece within the “Disney History” Series, and the 67th in the collection.